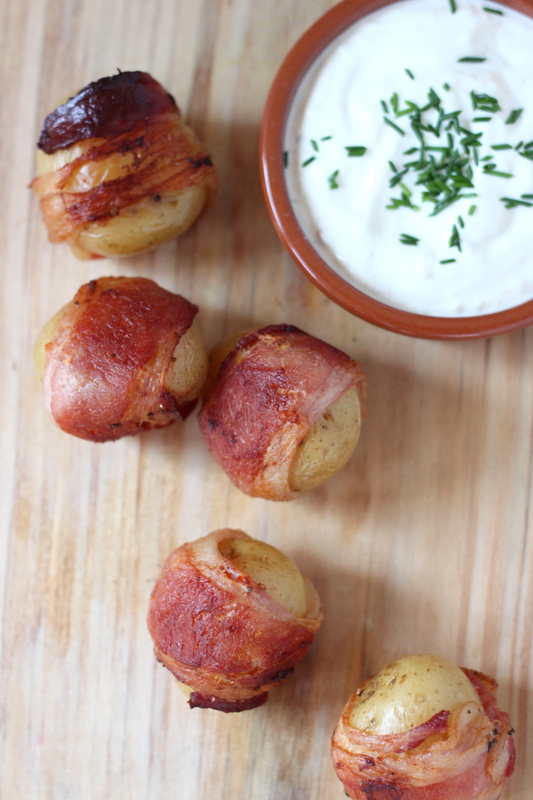 Potato wrapped in pig. By no means a new invention but one that you pretty much can’t go wrong with. I believe in layering flavors and as you’ll see from the recipe below, I start by boiling the potatoes in bay and garlic. This is my go to process (and maybe even a bit of a secret), even for mashed potatoes (I leave the garlic in – don’t tell anyone). 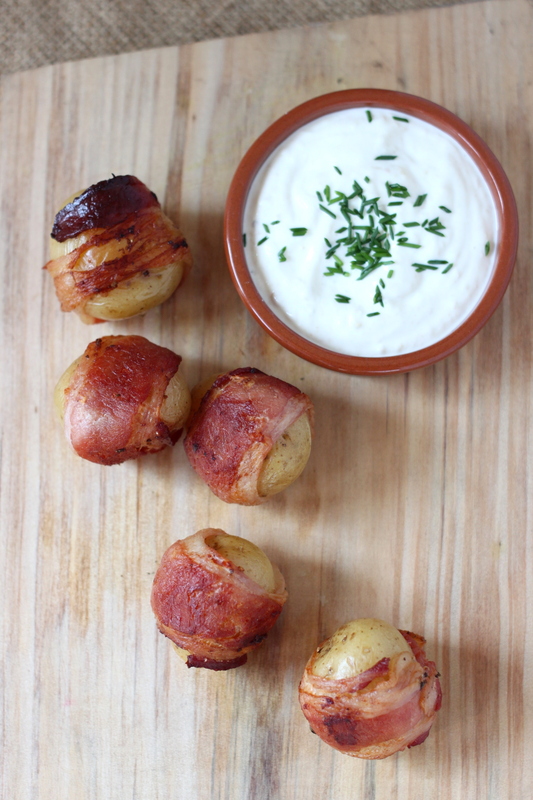 These beauties wrapped in salty bacon coupled with creamy and herbaceous aioli creates a fresh and interesting contrast. Choose the smallest potatoes around the same size you can find. You can’t go wrong with these. Potato wrapped in pig. By no means a new invention but one that you pretty much can’t go wrong with. I believe in layering flavors and as you’ll see from the recipe below, I start by boiling the potatoes in bay and garlic. This is my go to process (and maybe even a bit of a secret), even for mashed potatoes (I leave the garlic in - don’t tell anyone). These beauties wrapped in salty bacon coupled with creamy and herbaceous aioli creates a fresh and interesting contrast. 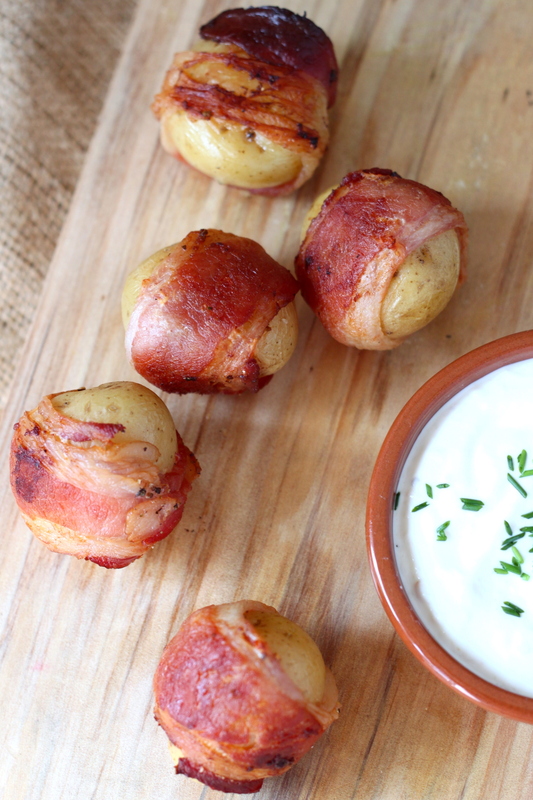 Choose the smallest potatoes around the same size you can find. You can’t go wrong with this. Enjoy. 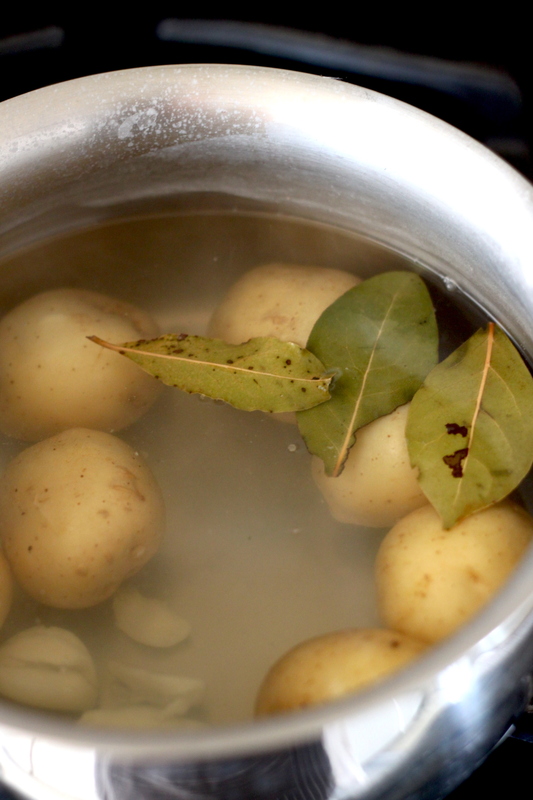 In a small saucepan over high heat bring potatoes, garlic and bay leaves to a boil. Cook until just fork tender. Drain water, garlic and bay leaves, set aside to cool. 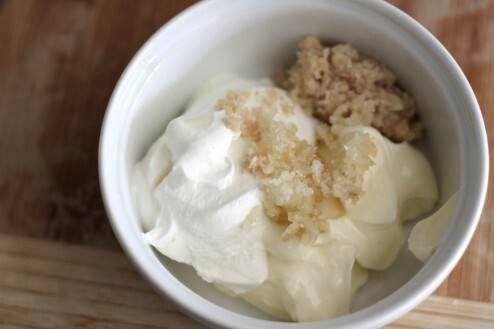 Meanwhile in a small bowl, mix the mayonnaise, sour cream, minced garlic and horseradish until well combined. Pour in serving bowl and top with chives. Line a baking tray with foil and set aside. 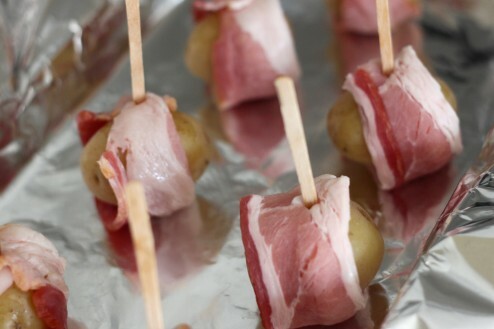 Wrap each potato with a half slice of bacon and secure with a toothpick by pressing it through the bacon into the potato. Bake for approximately 20 minutes being sure to flip each potato once to ensure even cooking. 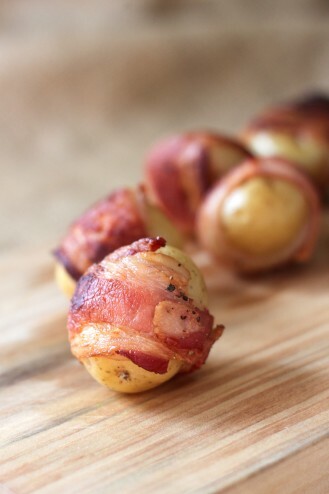 Once bacon is golden and crispy remove from the oven and let cool for 10 minutes. Place on a paper towel lined plate to drain. 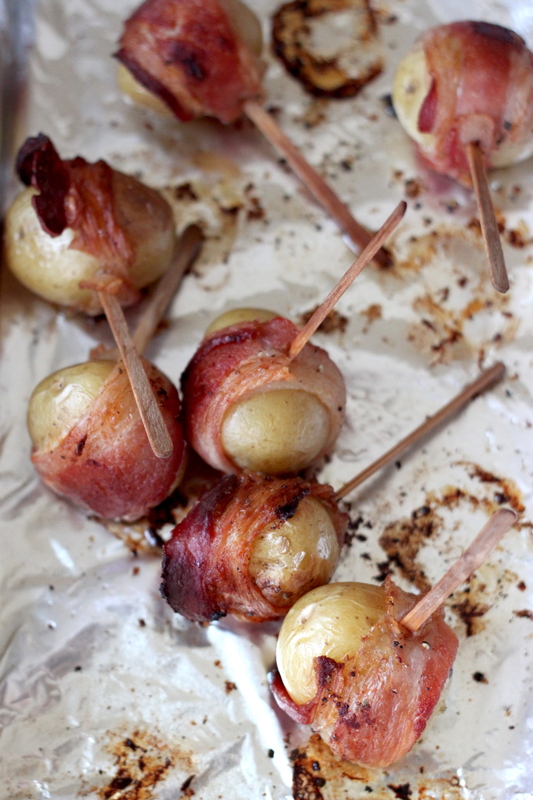 When ready to serve, remove the toothpick and place on a serving platter along with aioli.